Roy Harp and assistant trailer engineer, Blue. 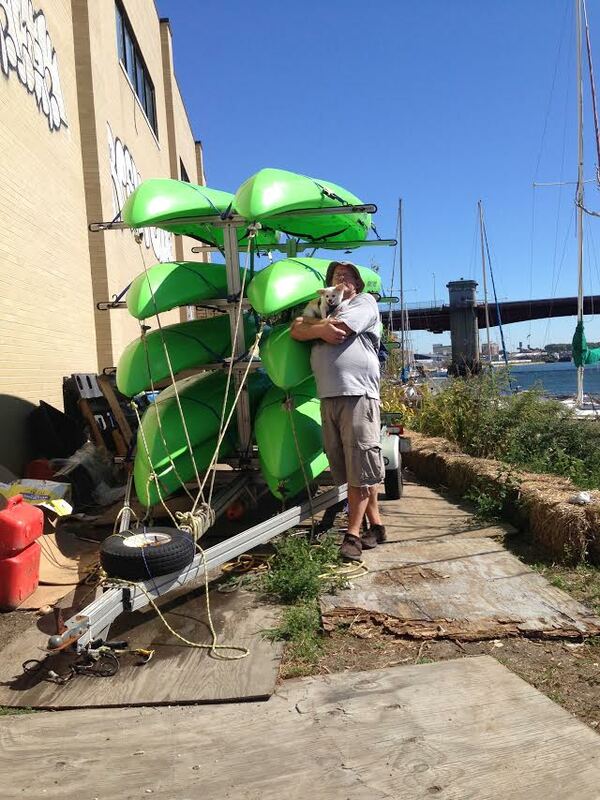 A huge thanks to HarborLAB volunteer Roy Harp for modifying our boat trailer to carry all ten of our tandem kayaks! That work, aided by the currently injured (no, not from kayaking!) Facilities Manager Patricia Menje Erickson, will enable us to increase our service to Gantry Plaza State Park and other locations where water is clean enough for kids and where youth and students can perform environmental service learning activities. For example, this summer HarborLAB paddled with Hour Children and CUNY students to remote islands to plant spartina and remove plastic trash. Our thanks again to Jersey Paddler for the discounted purchase price and to Patricia’s crew, especially Mairo Notton, for improving the trailer upon receipt. Many thanks also to those who drive the trailer to make community programs possible — Patricia, Jeff Lim, Gil Lopez, and Roy. We’ll put the trailer to work this Sunday in a fundraising paddle to support our environmental education work!